Parks Department workers discovered a silver .25 caliber gun hidden inside a work glove at Green Central Knoll Park on Monday, November 21. 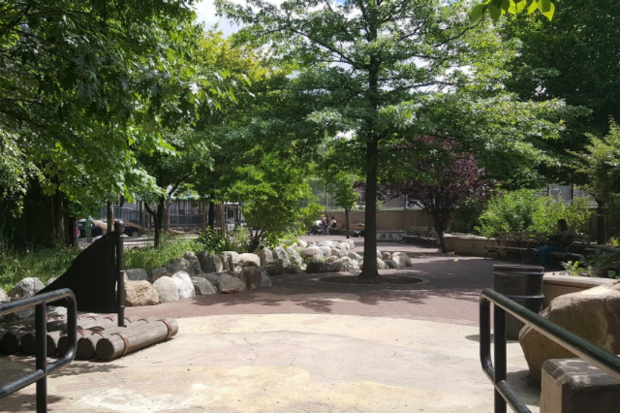 Bushwick parents who bring their children to Green Central Knoll park are upset by the news that a Parks Department cleaning crew found a loaded gun there on a recent weekday morning. Families at play at Green Central Knoll on the morning of Monday, November 21 looked on as Parks Department workers came upon the gun, a silver .25 caliber firearm which police say was hidden inside a work glove. The workers who found it rushed across Central Avenue to the building that houses the NYPD's Police Service Area 3, which patrols the 22 New York City Housing Authority Developments within the confines of the 79th, 81st, 84th, 88th, and 90th Police Precincts. Police from Service Area 3 who responded discovered the that the weapon was loaded and rendered it safe, and the investigation is now closed. "This is a pretty simple case," an NYPD source explained to Bushwick Daily. However, the incident is not so simple for local parents, who understand that life in any city is not without its dangers but are unsettled when those dangers manifest so close to home. Magali Charron, a local mom who witnessed the discovery of the gun, noted with unease that it had been buried under leaves—which her two-and-half-year-old daugher loves playing in. When she posted about the incident on the Facebook page of local parenting group Bushwick Parents/Padres de Bushwick, it got a lot of attention. Bushwick Parents organizer Ingrid Ramos says that the group is geared towards "increasing the quality of outdoor play spaces and opportunities for the community to connect—" and that safety concerns such as this one are among many things the group has discussed with Antonio Reynoso, who represents New York City's 34th City Council district, which includes parts of Bushwick, Williamsburg and Greenpoint. Incidents like the discovery of the gun are an undeniable conversation starter in the group. If you find a firearm or any other deadly weapon, don't touch it. Call 911 immediately so that the NYPD can take care of it.